It's amazing to experience a festival where there are between 20 000 and 30 000 people (I haven't seen the official numbers yet) through the gates on one day. That is what happened at the ABSA Kirkwood Wildsfees on Saturday and going by the reaction of the artists I don't think they get to perform in front of those kind of numbers every day. This was still early the afternoon but once the big name artists started to go on stage the crowd really came alive. We needed to keep warm as well. This past weekend the ABSA Kirkwood Wildsfees took place in the Sundays River Valley (note how I didn't say Kirkwood as I thought the name is quite obvious). 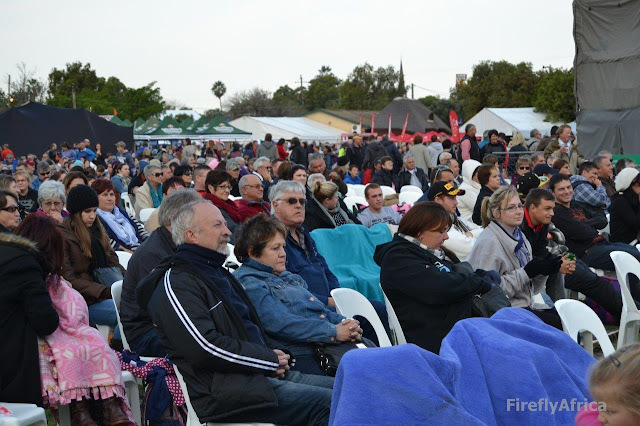 The Wildsfees has really become a serious contender as a "not to be missed Afrikaans music festival" with all the fringe actives and obligatory stalls and entertainment added on. 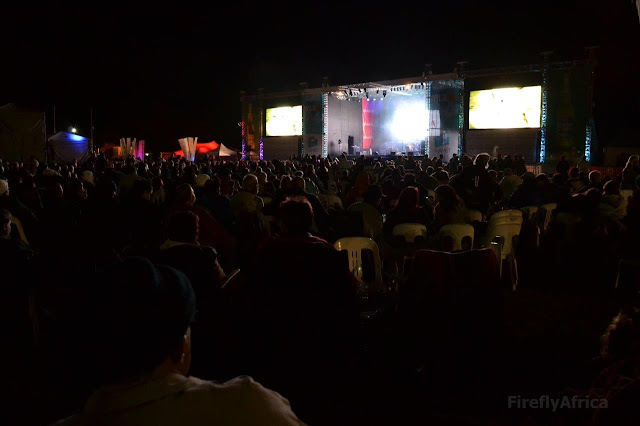 The highlight of the weekend is the music on the main stage with some of the best and most highly rated Afrikaans artists in South Africa on offer. This post is basically to highlight the actual stage. It, along with the big screens and sound attachments are HUGE stretching close to 50 meters from side to side. Throughout both Friday and Saturday (we didn't stay for the Sunday as both us and my wallet was seriously festivaled out by Sunday morning) the artists kept commenting how impressed they were with the stage and especially the sound. Kurt Darren even commented how this is the first time in ages that he went on stage for a show without doing a sound check and the sound was perfect. Makes supporting a festival like this even more worth it. 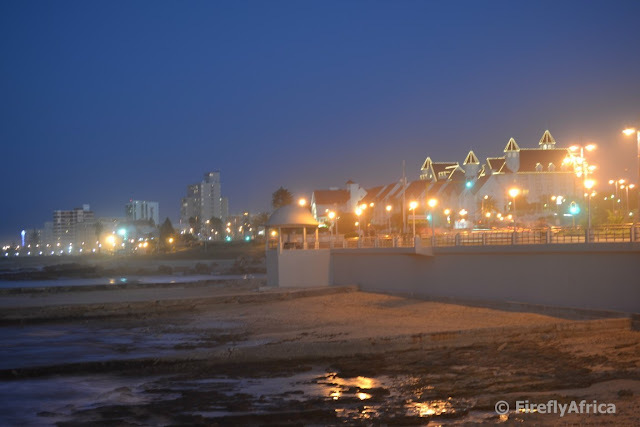 The old Humewood slipway is one of the city's landmarks that often pop in in photos of the beachfront. Oh look, it just popped up again. If you are on the beachfront in Humewood one tends to think that east is directly over the bay and west is then behind you (if you are facing the bay). 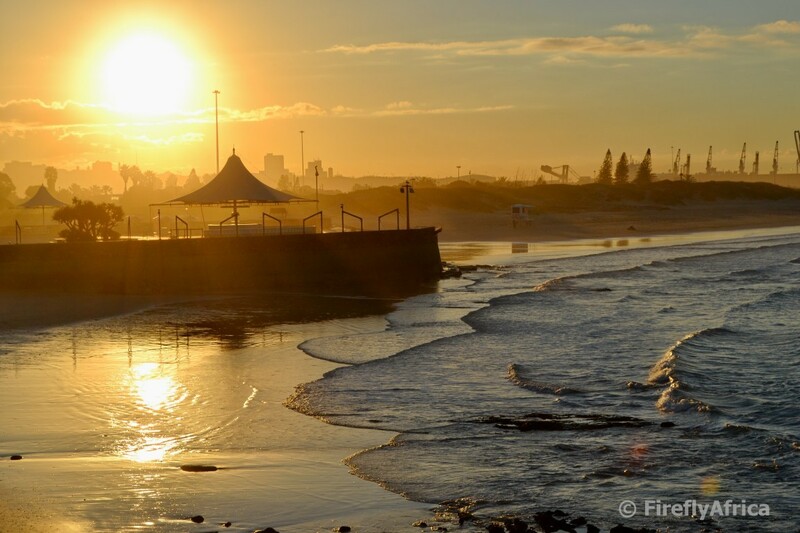 The curve of the beachfront is slightly deceptive with west actually being to the left which means that the sun goes down over the city centre. There seems to be a little bit of red tide in the bay at the moment going by this video by Jared Cassidy showing up so bioluminescent on the beachfront earlier this week. The view from the top of the dunes at Colchester is amazing. On the one side you look down on the Sundays River flowing down towards Algoa Bay while the view the other way is across Algoa Bay towards Port Elizabeth with St Croix Island in-between. How often do you go for a walk in nature and not really notice the little things? I think the answer is "quite often". 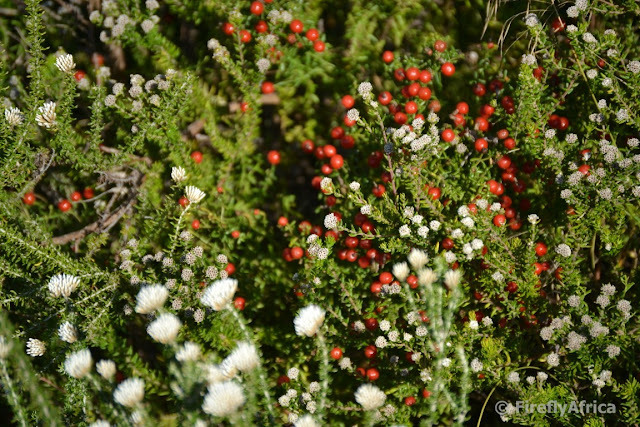 You may notice the flowers or berries in general, but very rarely stop to have a closer look. A Sunday afternoon caching walk with Drama Princess had her nearly walk away from me as I kept stopping and having a closer look. 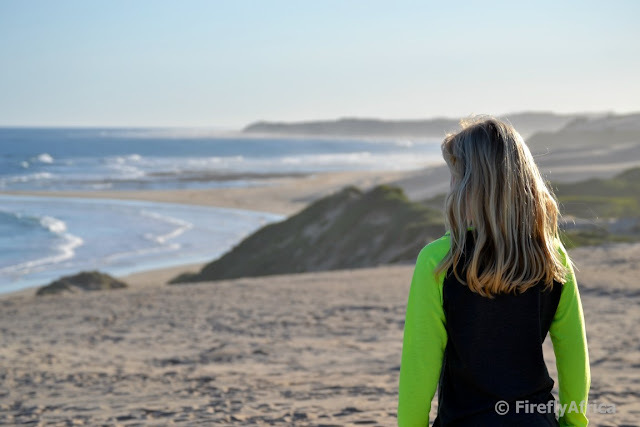 Drama Princess enjoying the view of the Sardinia Bay coastline from the top of the migrating dune at the parking area after our caching walk last weekend. 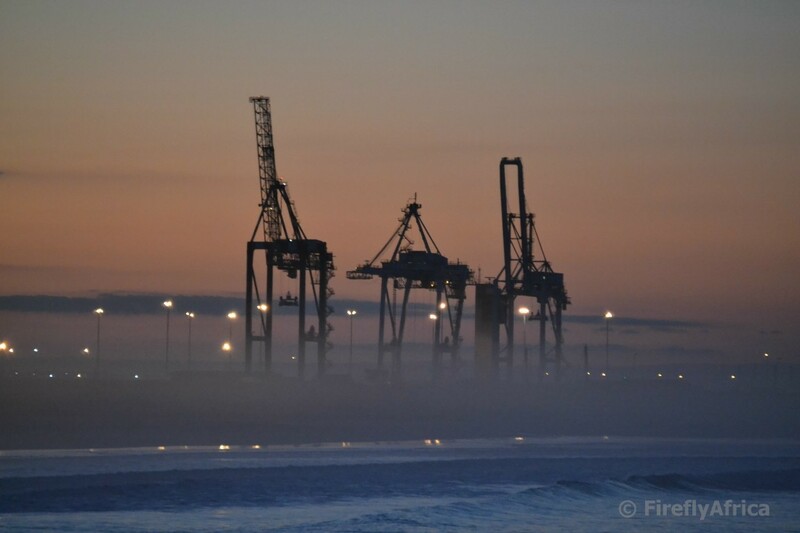 A meeting after work last week meant that I was on the beachfront after sunset and it gave me a chance to snap a few pics. I'm still figuring out the settings on my new SLR so played around and then realised that I should have had my tripod to really get some nice pictures. This was the best of the ones I got and only once I downloaded it did I realise it was blurry. Darn! But decided to share it with you anyway. Hope to get a better one next time. Last weekend I went for a Geocaching outing with Drama Princess. 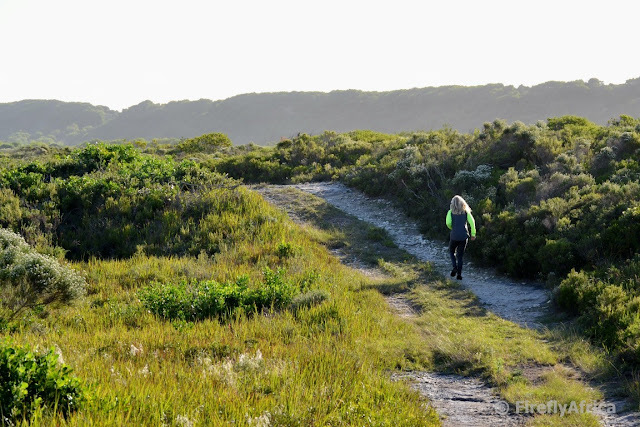 Two of the caches we did was along a path in the Sardinia Bay Nature Reserve. I love how Geocaching is allowing me to spend time with my KidZ in the outdoors. Last week I got to check out the new sand sledding activity in Colchester. 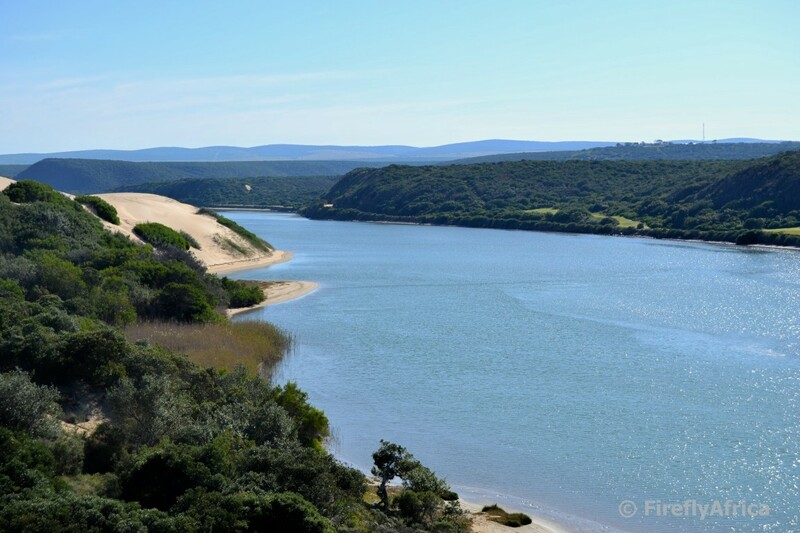 Addo Sand Sledding is presented by The Sundays River Ferry and includes a leisurely cruise down the Sundays River towards the river mouth, a climb to the top of the dunes for the awesome view across Algoa bay back towards Port Elizabeth and then sand sledding. Les Kingma had special sand sleds designed and made and believe you me, it is an awesome experience enjoyed by all ages. The oldest person in our group was 76 and he made it look like a breeze. I still need to process my pictures and video I took and will post about the experience on The Firefly Photo Files as soon as I get a chance, but here is a video of the day uploaded by Les yesterday. You can see me take a turn at 2:30 into the video and look out for the spectacular wipeout (the only one of the day) by Paul Miedema of Calabash Tour right after me. It's bigger... It's better... It's louder... It's Imax and it's here in Port Elizabeth. 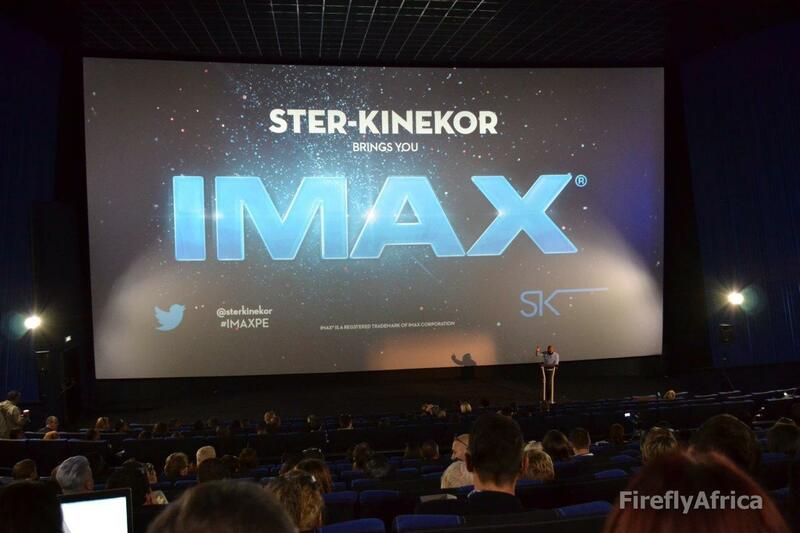 Ster Kinekor has opened it's fourth Imax theatre right here in Port Elizabeth as the new Baywest mall. 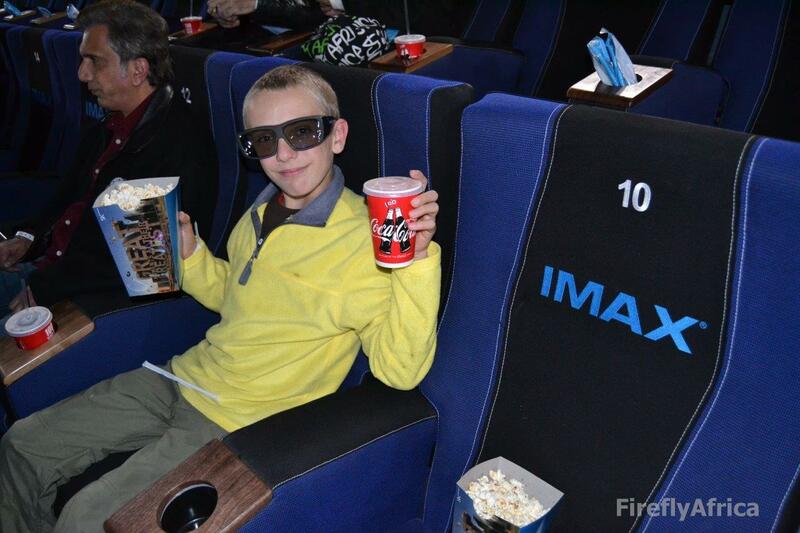 Last night Chaos Boy and I joined the who's who of the Bay at the grand opening of Imax. And was it a grand opening. VIP welcome, blue carpet, cocktails, snacks and then it was movie time. Jurassic World in 3D. Wow, wow, wow!!! Imax, along with 5 regular cinemas and two luxurious Cine Prestige cinemas officially open today. I have a feeling it's going to be a busy weekend at the movies. 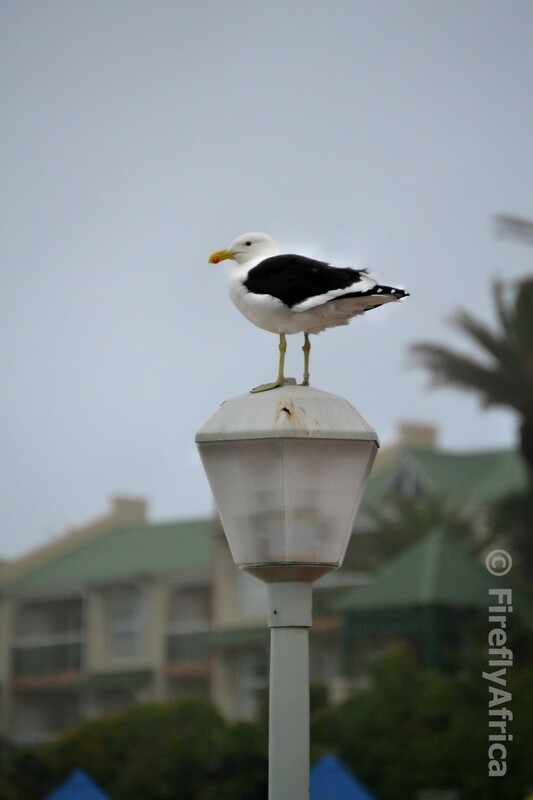 After a late meeting on the beachfront last week I decided to snap a couple of pictures before heading home. Looking down to the Port Elizabeth Harbour through a bit of haze it looked like a Star Wars Imperial Walker have joined the Harbour Giraffes. 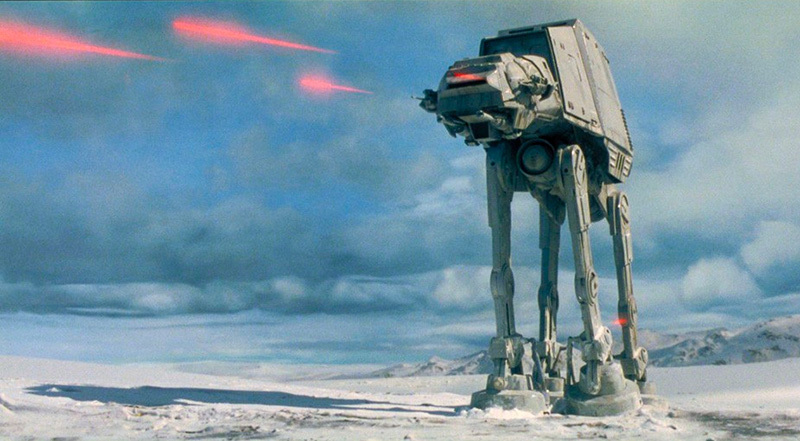 Just in case you don't know what a Imperial Walker is, see below. 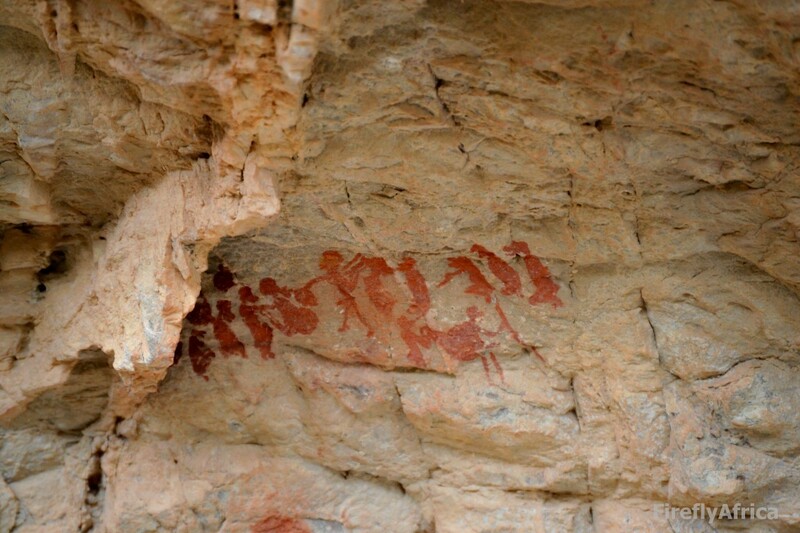 A recent visit to Baviaans Lodge in the Baviaanskloof included a visit to a rock art site not too far from the lodge. It truly is a privilege to be able to experience a place of such historical and cultural importance. It's a misty morning. Waves lapping at the beach. Gulls gathering on the sand before the first dog walker passes and Butch decides to chase them off. Activity in the harbour beyond. Traffic on Beach Road. Morning on Kings Beach. Our church (Hoogland Dutch Reformed Church) recently installed a public tap for runners and others in need of a drink of water. I love the creativity of whoever was in charge of the project. Today is World Wide Flash Mob XII. It's a Geocaching event started twelve years ago with the purpose of being a short gathering of Geocachers, lasting 30 minutes before everybody heads off again. Very much a flash mob. 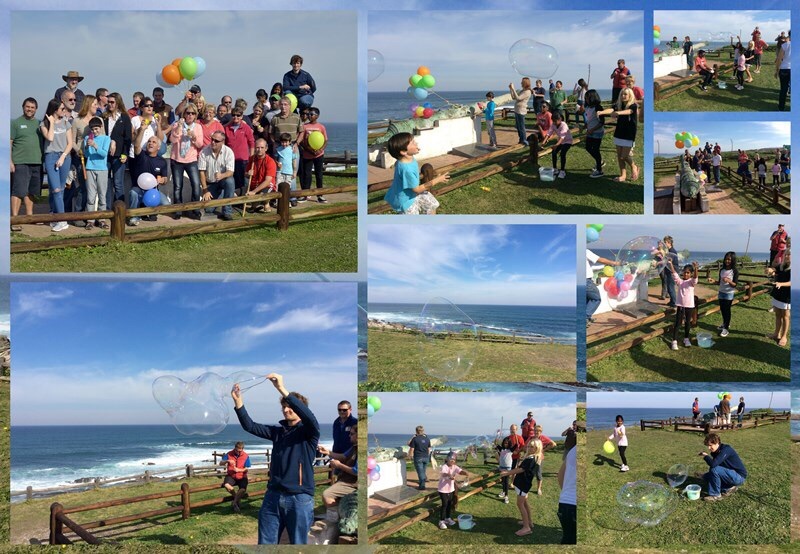 This year the Port Elizabeth Geocachers gathered at the Sacramento cannon in Schoenmakerskop and the theme chosen for our flash mob was bubbles and balloons. At exactly 12:15 we took our group photo as required and started blowing our bubbles. Quite a few muggles (non-Geocachers) stopped in their tracks and watched the goings on, probably wondering what was going on. The credit for the photos go to Ansie of Team Wikkelgat. 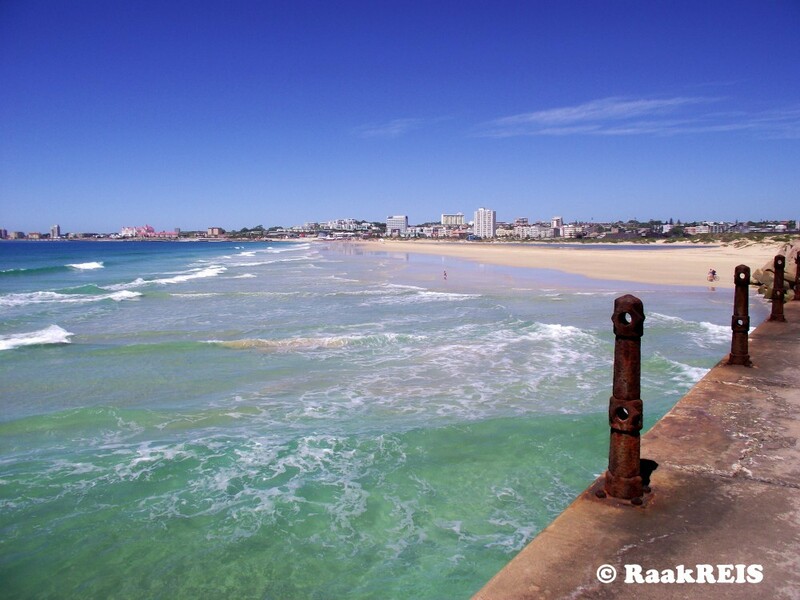 Port Elizabeth truly has some outstanding dive sites both inside Algoa Bay as well as on the Wildside. So what can one expect from a dive in PE? Colourful soft coral, lots of fish species, shark sightings, ship wrecks and so much more. I found this video on the Pro Dive YouTube channel of a diving excursion out to Bellbuoy Reef in Algoa Bay. Makes me want to dust off the ol' wetsuit and book a dive. Last week we had some stormy weather pass over Port Elizabeth. 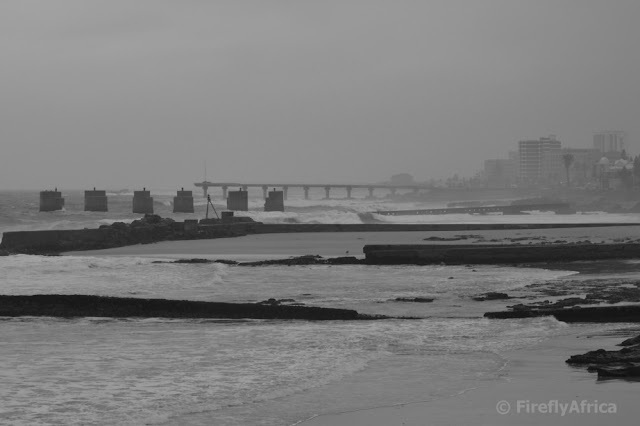 Rain, cold and very rough and high seas were the order of the day. 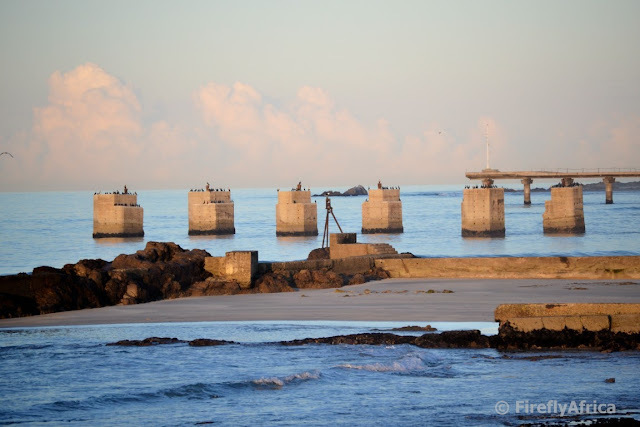 I stopped on my way to work one morning and this was the scene looking towards Humewood and Hobie Beaches. 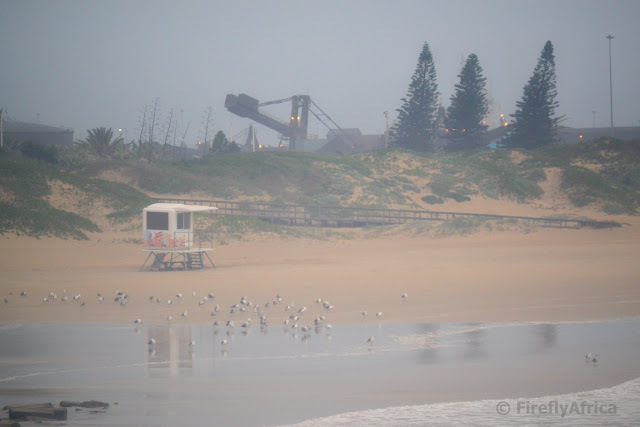 Saturday morning I braved the cold to head down to the beachfront for the weekly Hobie Beach parkrun. To say the air was crisp is an understatement and you could see runners head to their cars quickly to take off their warm tops just before the run started. As always I had my camera with me and I snapped this pic at about 7:30ish. I need to brave the cold mornings more often. 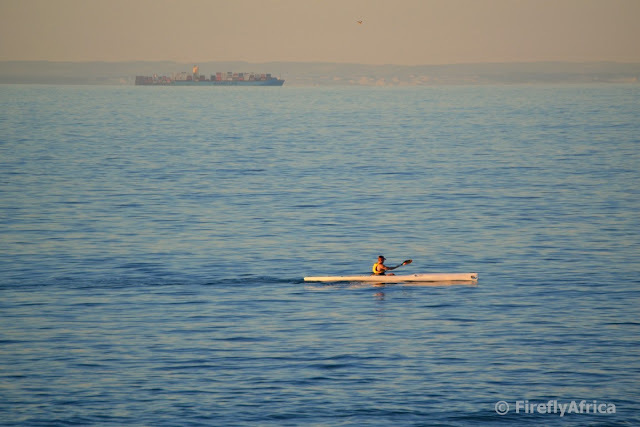 I don't think people living in Port Elizabeth always realize how special Algoa Bay is. 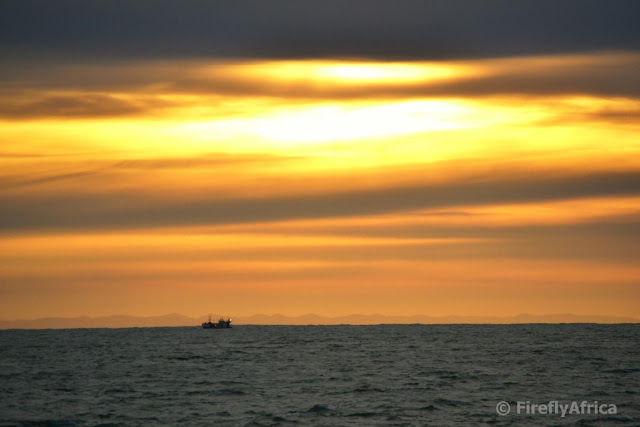 African penguins, visiting whale (and sometimes even Orcas), dolphins, sardine run starting off our shores, different shark species, scuba diving, great fishing and so much more. 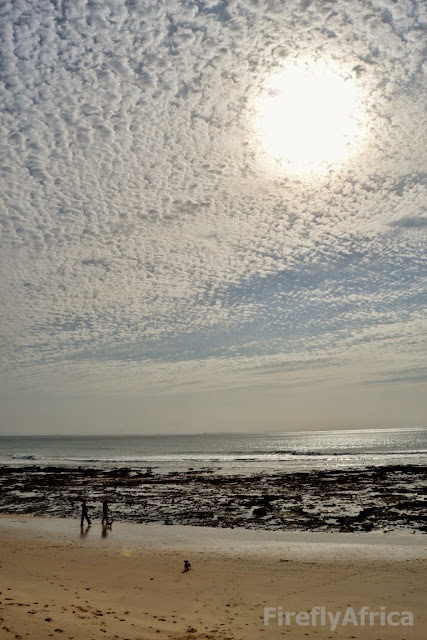 Algoa Bay is home to a couple of species of dolphins and you see pods of Bottlenose Dolphins swimming along our beachfront on just about a daily basis. Driving along Marine Drive from the Boardwalk towards town I spotted a big pod of dolphins swimming along Kings Beach towards me at speed. I changed lanes quickly and u-turned below Brookes-on-the-Bay, parking across the road. By the time I was at the walkway railing most of them were past me already but I did catch a few of the back markers. There is no way that these photos are anywhere near giving credit to the sighting. It just made me appreciate a little bit more living in this beautiful place we call home. 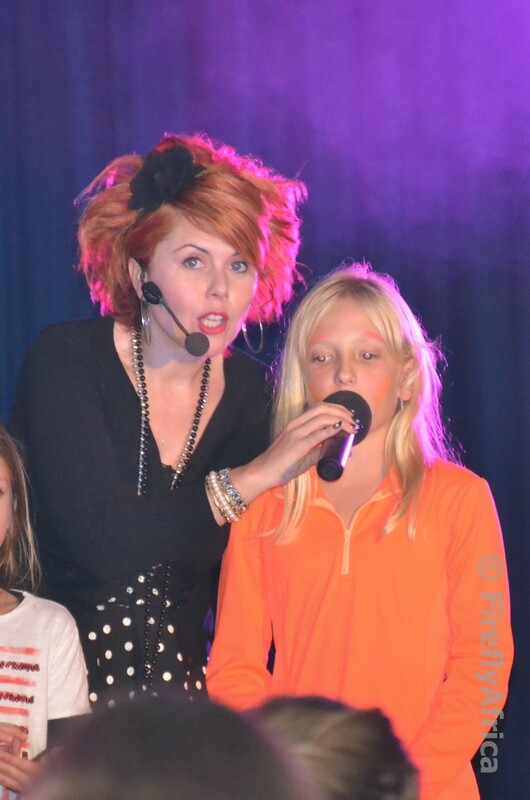 On Saturday night we went to a Nedine Blom concert at Sunridge Park Primary School. Drama Princess was invited to a birthday party at the concert and as Nedine Blom is the KidZ' favorite musician, the rest of us wasn't going to miss it either. She does a lot of fun and gospel music for children and the KidZ know all her songs. 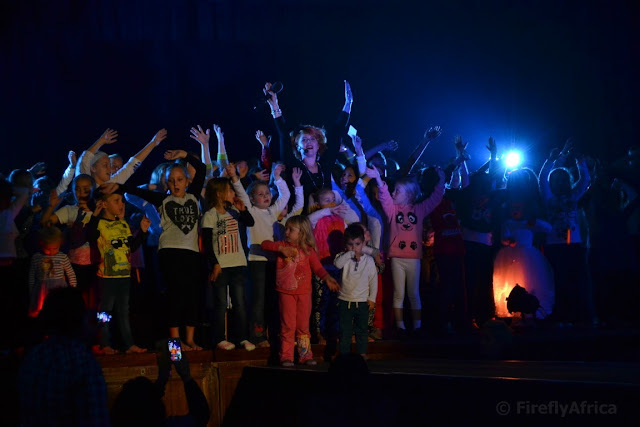 She allows to interact with the children in the audience and gets them onto the stage in groups to dance along with the songs. Drama Princess was one of four children that went on stage to sing with her during one song. We could not believe that she even knew all the words as well as she did although we weren't surpised at all that she was willing to go on stage and sing. 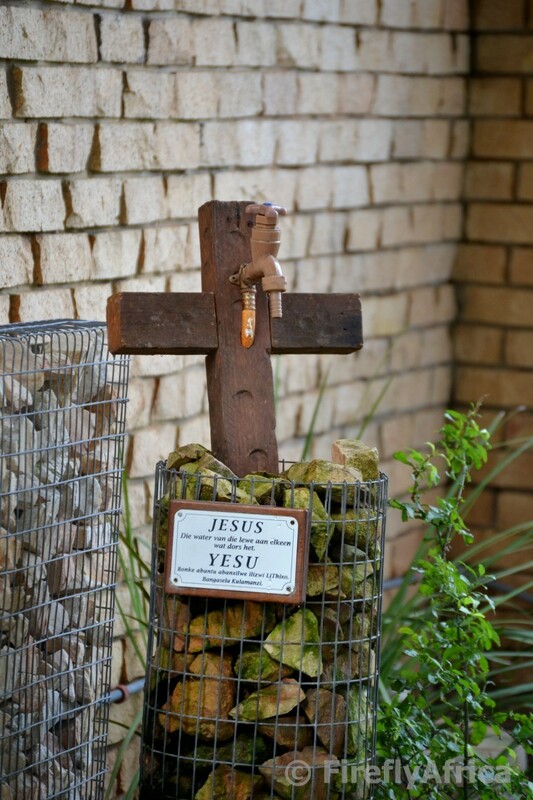 I joined a couple of fellow cachers on a Geocaching expedition today. We needed to call in the help of Mr Stretch and even then there were times that he wasn't tall enough. 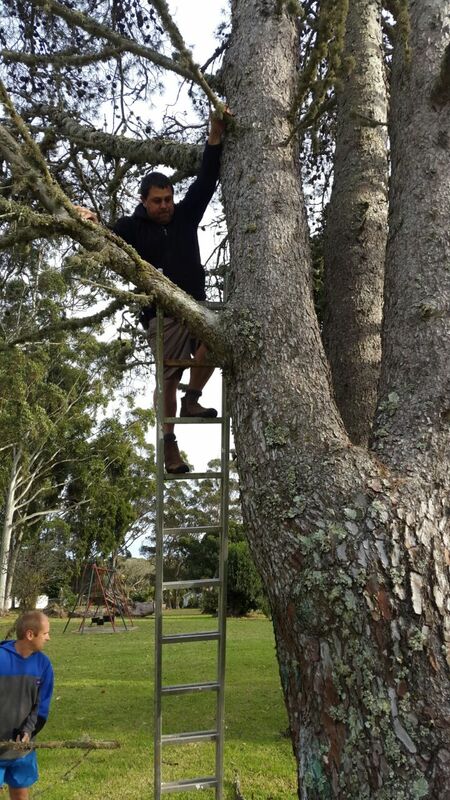 Heck, we didn't even know if we were checking the right tree... Or were we? I was looking for a video to post for today's Video Friday post and found this one of a surfing lesson at Kings Beach on Blake T's YouTube channel. I've never surfed in my life but perhaps it is time for me to try. The lessons look like fun. 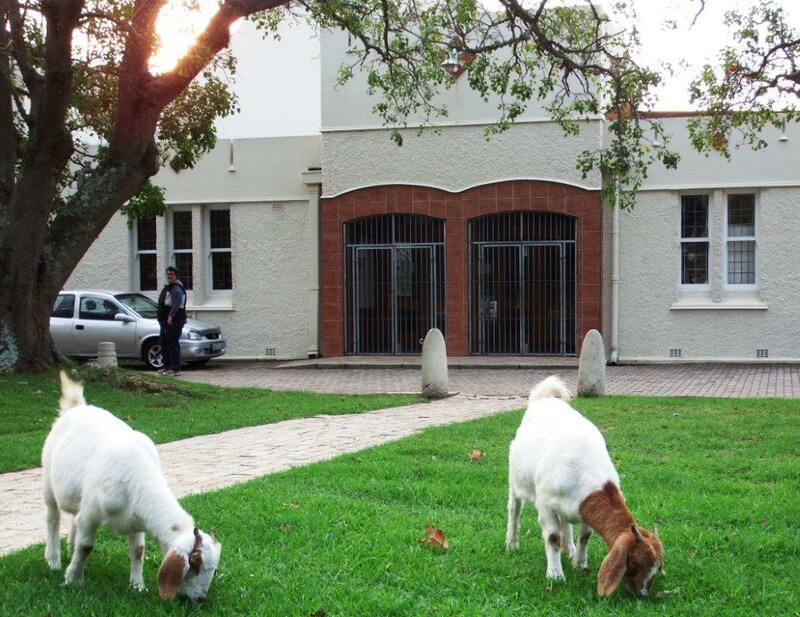 I got a mail from regular PEDP reader Gerhard Burger last night asking me if I have seen that there is a new garden service company taking over at the Walmer townhall. 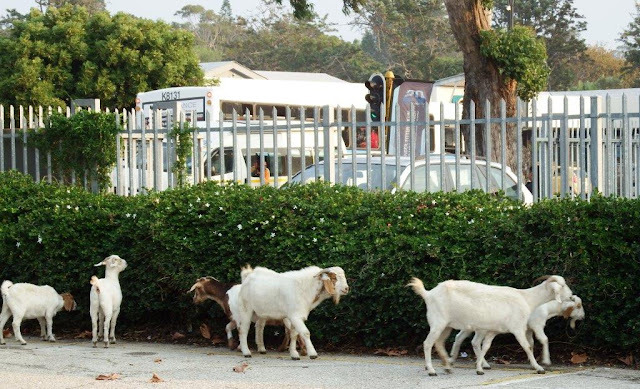 Perhaps the lawns and hedges will stay nice and neat now which may lead to the municipality extending the service to other parts of the city. I wonder how many PE people have ever walked all the way down Kings Beach right up to the harbour wall. I did it a little while ago on a beautiful day and took this picture looking back along the beach from on top of the wall. Right next to the harbour wall is a surf spot called Fence. Why is it called Fence? The answer I got from local surf blog Millers Local. Back before all the sand built up against the wall this left hand surf spot used to produce really great surf. Although it doesn't go as big as it used to it apparently still has a very dedicated following. But lets get to the name. There used to be a big fence that ran along the harbour wall to stop people from climbing onto the wall from the beach to go fishing. Nobody can really say when the fence was put up or disappeared again but according to local surfer Gary Cooper it was there when he started surfing fence in ’64. Apparently the barbed wire fence was located about 150 - 200m from the harbour wall and ran right out into the water at Spring High tide. There were signs on it saying Property of the SA Harbour and Railways - Keep Out! Not that the surfers worried much about it. When the harbour wall was extended the sand started building up with the result that the fence eventually got covered up by sand completely. Its been cold and grey over the last two days with more to come. Clearly this wasn't taken over the last few days. 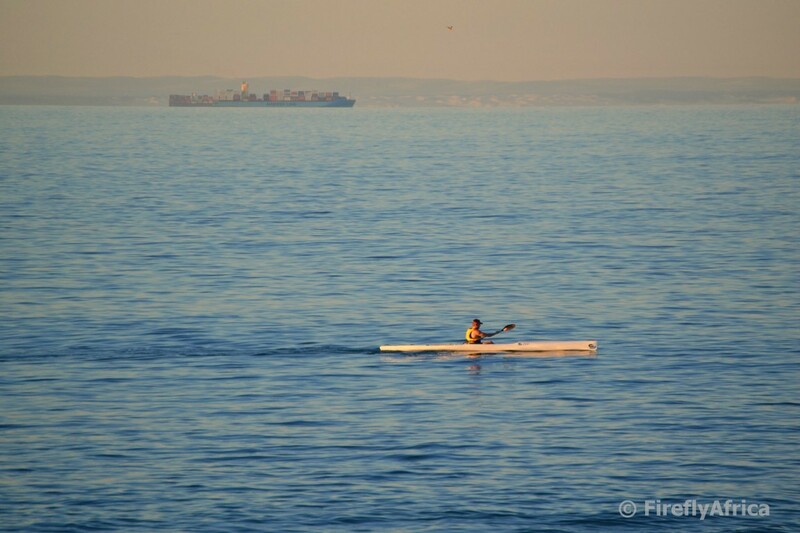 I did take it last week though when we had one of PE's typical stunning autumn days. I haven't been to the historic part of PE for a while and the pictures on PEDP probably shows that. Between work and family I have just been so busy that I haven't been to try out my new camera in the old part of town. 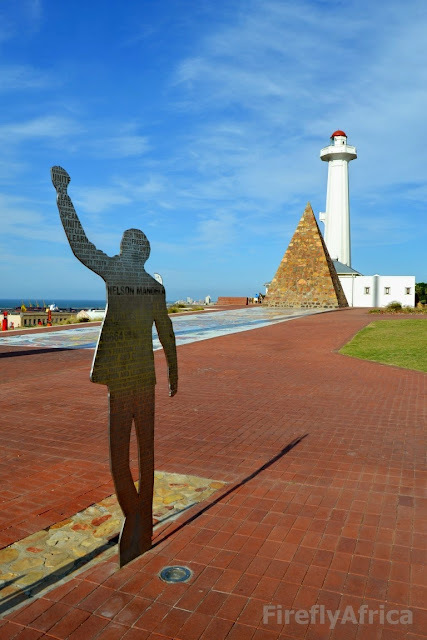 A quick stop at the tourism visitor centre at the Donkin Reserve to drop off brochures gave me a chance to snap one or two pictures before I had to rush off again. Just waiting for a quiet day and I'll slip out and go and take a few pictures in the area again.